If the Bible was the collective blogging effort of men of old, this would be the tag cloud. This is the ultimate word study turned graphic. These 11″x17″ posters turn the words of the Bible into home decor. I call it decorative evangelism. Want to get an idea of what the Bible is all about? Scroll through these posters that visualize word frequency in the Bible and you’ll agree that the Bible is focused not on dry doctrines but on a living person! 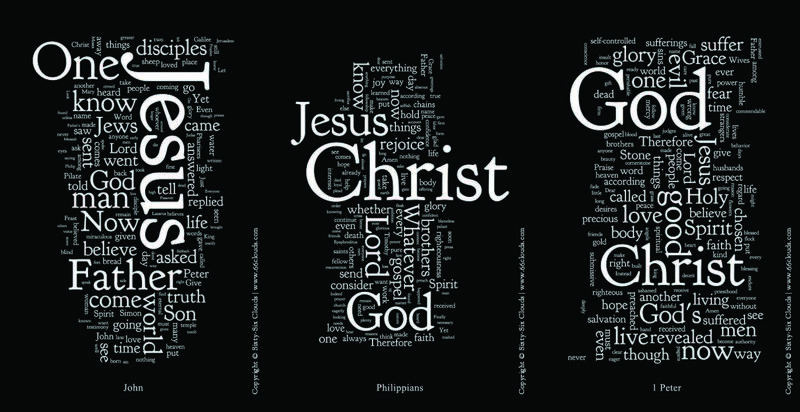 The three posters above, from the books John, Philippians, and 1 Peter demonstrate this. Paul, John, and Peter were the three major authors of the New Testament, writing from different backgrounds, with different perspectives, to different audiences, in different regions, at different times. And YET all their writings stress the Triune God for our experience. Use the link above to check out the website! There’s a poster for every book in the Bible. This entry was posted in things i love and tagged Bible, cool, design. Bookmark the permalink. I heard about this today at a John seminar at the University of Texas at Austin with Christian Students on Campus. It was refreshing to be brought back to Christ. He should be the focus. I have been to other Bible studies on the gospel of John where they talked mainly about the difference between pharisees and sadducees. I also learned all about samaritans but not too much about Jesus. If I made a tag cloud from that, the biggest word would have been miracles. What a tragedy to miss the Man behind the miracles, THE MAN CHRIST JESUS! May our Lord Jesus consume us until we see Jesus only.